The ultimate bamboo handmade by Musashi! Part of a new 1060 high carbon series from Musashi, the focus of this production was to forge the best blade possible for under $100. With the result being well within that goal, this blade is nothing short of an excellent value. Handmade, the blade hamon is formed by the clay temper process during production. The blade is differentially hardened and comes extremely sharp! Like the more expensive models, this blade can even be bent 45 degrees and will return to the straight and true form. 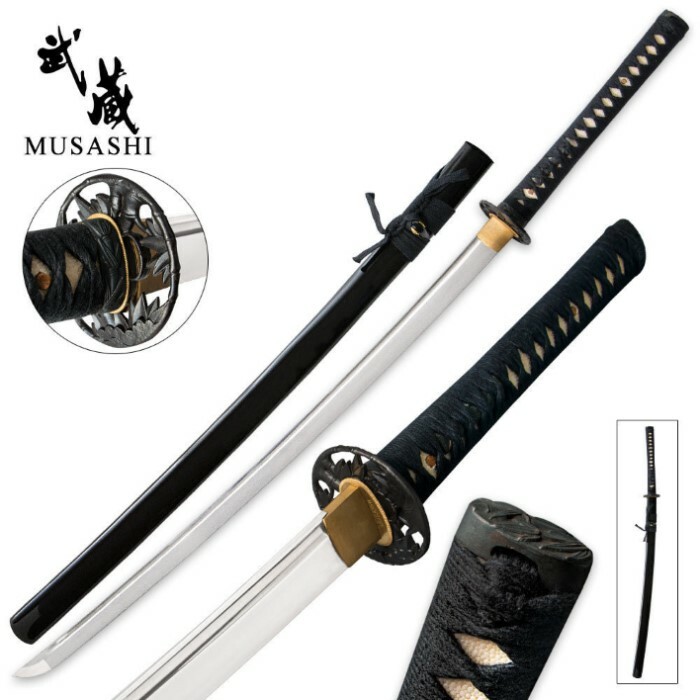 This is a great sword for the price point!... It appears to be hand forged as I can see very slight waves along the spine. But the blade is straight and aligns with the handle. Everything is tight. No rattles. There are two things I'm disapointed about... 1.) the blade is not evenly sharpened. Some sections sharper than others. Last 3 inches near tsuba are smooth and. Rolled over. 2.) There appears to be sandpaper scrathes. In the middle of the blade. Anyways, I will keep it. This is it ladies and germs, a REAL sword. It IS 1060 steel, the hamon IS real, quality IS great (for the price) but don't buy it unless you can sharpen it. If does NOT come "razor sharp," or even "sharp." 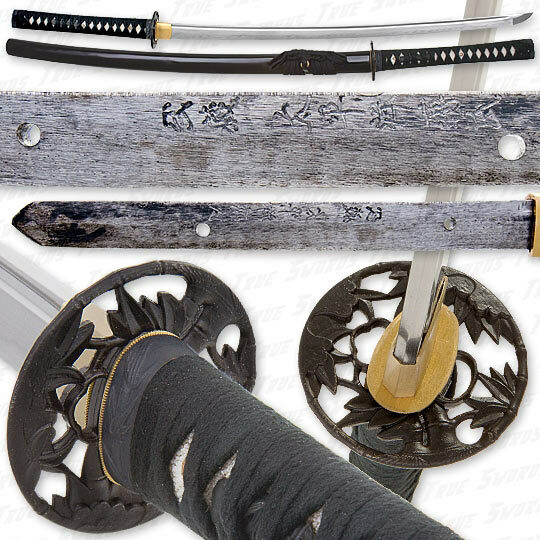 Otherwise once sharpened it is a great price for a real katana. I'll go so far as to recommend it, but only for a serious collector. Very nice sword for $100! Well put together, double pegged, full tang, no rattling, tight Ito....etc. I'm sorry but I have to laugh at a few people. The kid who said "after watching videos with REAL Japanese people in it, he was cutting things WELL beyond what this sword is "rated" for." Sorry but this sword has no "rating" on it Hahahaha. 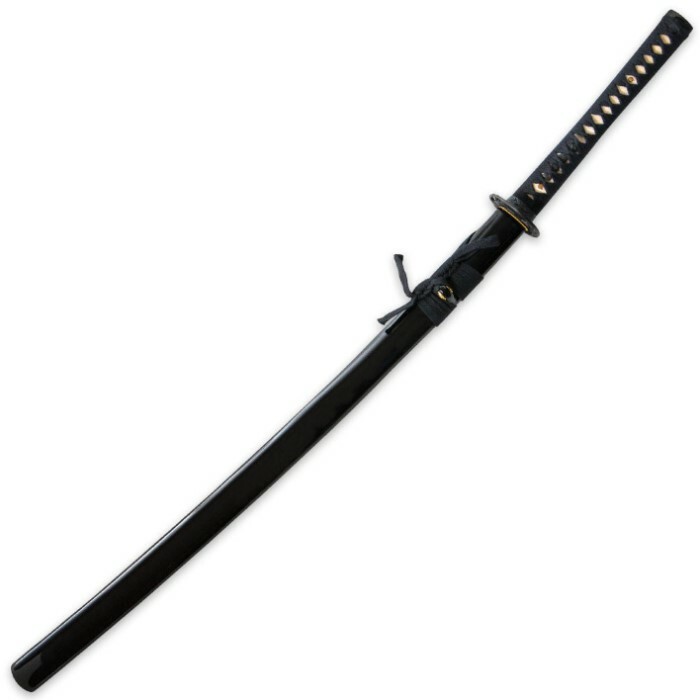 Then the fool who says he has a 9260 steel Cheness katana that is beat out by this $100 1060 katana! WTF??!! Dude, send me your "subpar" Cheness katana and I will GLADLY GIVE you my copy of this sword for free!! Idiot. There's always one or two who write such uneducated, foolish, "reviews." *sigh* Anywho, like I was saying. For $100 this is as close to having a $200-$250 sword as you are going to get. I would recommend buying one, and I am pretty dang picky when it comes to my sword collection and what goes in it. Cheers. Beautiful and light weight. Very sharp and sturdy. My new favorite. Totally worth it. After reading and watching some videos (The ones with real Japanese instructors) for a few days I finally decided to swing at a few things. I was cutting things way above what this sword was rated for and the blade edge is completely undamaged. This product really impressed me. It's not junk, it's a fine weapon and I am sold on True Swords! Cuts through bottles like they are not there. Good heat treat. Missed bottle. Hit 2x4 wooden stand. Cut into wood 3/4" deep. No chips, dents or nicks in blade. No scratches. Sword is put together tightly and fits snug inside the tsuba. Bought one for stepson for Christmas and when I looked it over ordered myself one too. Real hamon. For a hundred bucks I like it better than my 9260 Tenchi from Chenessnthat cost three times as much. It just feels better in my hand. Handle longer with slight wasting in grip. Get this you won't regret it. Just as expected, have no complaints what so ever. Quality product from a quality company.